With recognition of the changing regional conditions facing the Railbelt, the Alaska Legislature recently requested a study to assess whether reconfiguring the electric generation and transmission elements of the Railbelt region would produce benefits in terms of cost, efficiency, and reliability. The contractors for the study evaluated five paths for potential reorganization and tested those paths under four potential scenarios for meeting electric power demand. The following descriptions of Organizational Paths 2, 3, 4, and 5 focus on the functional responsibilities of a new regional entity. In each case, the new regional entity could be a Joint Action Agency (JAA), generation and transmission (G&T) Cooperative, or State Agency/Corporation. Path 1 – Status Quo. 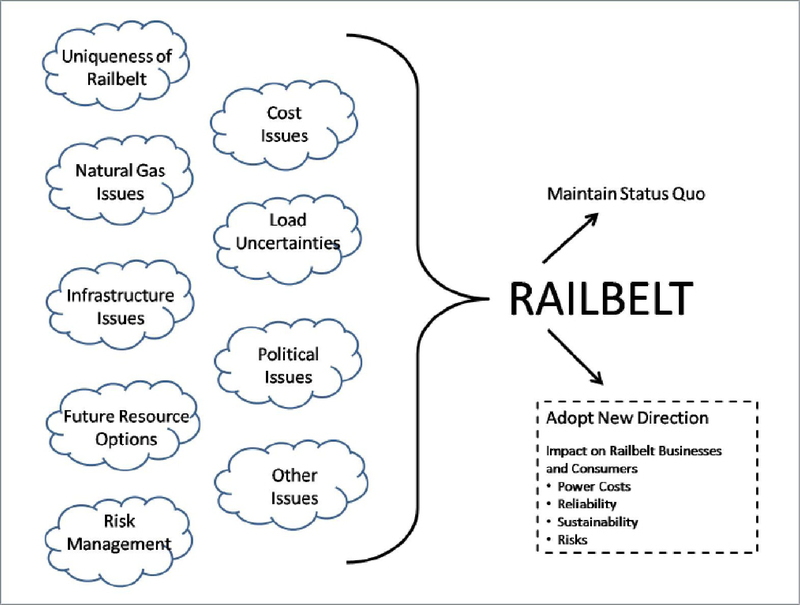 This path assumes that the six Railbelt utilities continue to conduct business essentially in the same manner as now (i.e., six separate utilities with limited coordination and bilateral contracts between them). It does not include the potential impact of the proposed ML&P/Chugach merger. This is, in essence, the Base Case and the other Paths are compared to this Path for each of the evaluation scenarios considered. Path 2 – form an entity that would be responsible for independent operation of the Grid. On this Path, a new entity would be formed to independently operate the Railbelt electric transmission grid. Currently, the Railbelt utilities have three control centers (GVEA, Chugach, and ML&P). The operations of these centers are coordinated (but generation is not fully economically dispatched on a regional basis) through the Intertie Operating Committee. This new entity would not perform regional economic dispatch, just the independent operation of the Railbelt transmission grid. Path 3 – Form an entity that would be responsible for independent operation of the grid and regional economic dispatch. This Path would expand coordination in Path 2 through the formation of an organization that would be responsible for the joint economic dispatching of all generation facilities in the Railbelt. This Path, as well as the following two, will require some additional investment in transmission transfer capability and supervisory control and data acquisition (SCADA)/telecommunications capabilities. 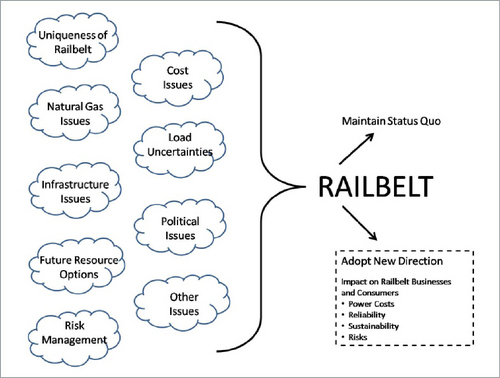 This Path, and the following two Paths, would also require the development of operating and cost sharing agreements to guide how economic dispatching would occur, and how the related costs and benefits would be allocated among the six Railbelt utilities. Path 4 – Form an entity that would be responsible for independent operation of the grid, regional economic dispatch, regional resource planning, and joint project development. This Path is similar to Path 3, except the scope of responsibilities of the new regional entity would be expanded to include regionally integrated resource planning and the joint project development of new generation and transmission assets. Path 5 – Form a power pool. This entity would be responsible for the independent operation of the transmission grid, regional economic dispatch and regional resource planning. In that sense, it is similar to Path 4, except that the individual utilities would retain the responsibility for the development of future generation and transmission facilities. Scenario A – The Large Hydro/Renewables/DSM/Energy Efficiency Scenario assumes that the majority of the future regional generation resources that are added to the region include one or more large hydroelectric plants (greater than 200 MW), other renewable resources, and demand side management (DSM) and energy efficiency programs. Scenario B – The Natural Gas Scenario assumes that all of the future generation resources will be natural-gas-fired facilities, continuing the region’s dependence upon Natural Gas. Scenario C – The Coal Scenario assumes that the central resource option is the addition of coal plants to meet the future needs of the region. Scenario D – A Mixed Resource Portfolio Scenario assumes that a combination of large hydroelectric, renewables, DSM/energy efficiency programs, coal and natural gas resources is added over the next 30 years to meet the future needs of the region. The final report and other resource documents are available online at www.akenergyauthority.org.